My earliest political memory is of my father’s reaction to my uncle’s observation that he thought Robert Taft would be a good president. Daddy narrowed his eyes and slowly shook his head: “Taft was never a friend of the working man,” he growled. Born and raised in Saline County, my parents were staunch Democrats, and my grandfather had served in the Legislature as a Democrat before it became a non- partisan unicameral. Creativity is my livelihood. I have several jobs. I am a professional musician (a classical pianist), a teacher, and an artistic director of a major performing arts center. I am lucky each of these jobs is centered on music and the arts and I am given a tremendous amount of freedom to be as creative as I want to be. 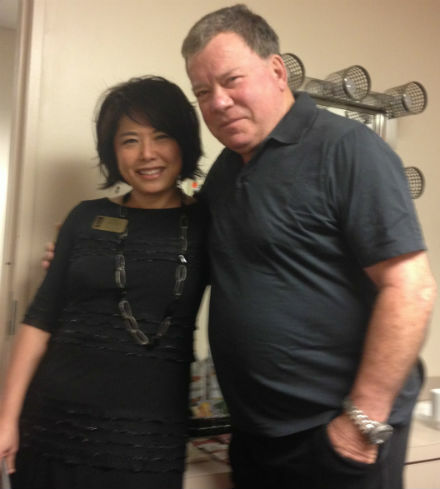 The perks of being the artistic director at the Lied Center – you don’t have to go to a Trekkie convention to see “The Captain,” he comes to you! As a pianist, the work centers on studying the composer and the piece in particular, and doing my best to eloquently communicate that to the audience. Most of the time, I select the program content, and creativity is a major part in developing the sensitive interpretation of the piece. Managing my own performance career requires a lot of creativity as well, particularly in fitting in tours or concerts within my “day-job” schedules. I’ve loved history and traveling the Great Plains for as long as I can remember. My mom and dad loaded my brothers and me into the camper every summer to take off for points in Nebraska, Minnesota, Wyoming, Montana, and the Dakotas, so I grew up knowing what a broad, diverse, and beautiful land it was.